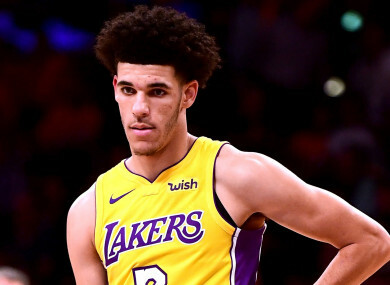 LOS ANGELES LAKERS rookie point guard Lonzo Ball has endured some rough moments this season, but he took a step back in the right direction with his second triple-double on Sunday. Ball helped the Lakers to a 127-109 win over the Denver Nuggets by scoring 11 points with 16 rebounds and 11 assists. Ball recorded his first triple-double on November 11 against the Milwaukee Bucks, after flirting with one the second game of the season. He joined Magic Johnson and Jerry West as the only Lakers to ever record multiple triple-doubles in their rookie seasons. Much maligned for his poor shooting, Ball reminded everyone why he was respected enough to earn the number two pick in this year’s NBA Draft with an efficient five for 13 shooting effort. While shooting may still not be Ball’s immediate strength, he ran the offense confidently, resulting in a plus-29 rating in 40 minutes of action. Stephen Curry scored a season-high 39 points to lead the Golden State Warriors to a 118-111 road victory over the Brooklyn Nets on Sunday. Golden State struggled at times defensively but Curry, who also had 11 rebounds and seven assists, helped the Warriors overcome a second-half Nets rally. The Warriors led by 22 points at half-time, but allowed Brooklyn to torch the nets for 42 points in the third quarter. Allen Crabbe led the Nets’ comeback attempt by scoring 25 points on six-of-11 shooting from beyond the arc. Klay Thompson scored 23 points with 10 rebounds for the Warriors to help the defending champions avoid an embarrassing upset loss. The Warriors (13-4) have now won nine of their last 10 games to tie the Houston Rockets atop the Western Conference standings. Eslewhere, two-time NBA All-Star David Lee announced his retirement yesterday after 12 seasons in the league. Lee averaged 13.5 points and 8.8 rebounds throughout his career, playing for the New York Knicks, Golden State Warriors, Boston Celtics, Dallas Mavericks and San Antonio Spurs. Email “Lonzo Ball records second triple-double to join Magic Johnson in the record books”. Feedback on “Lonzo Ball records second triple-double to join Magic Johnson in the record books”.